In today’s construction industry, sustainable building practices are becoming more important to the success of a project. With a minimum of 25 percent guaranteed recycled content, cold-formed steel meets the tests for an environmentally responsible material and can be an important addition to any project where sustainable construction and design is a critical requirement. Because steel is a recognized green building material, steel-framed structures can earn credits or points for many local green building rating programs and government incentives. These sustainable attributes are not only playing an increasingly important role in selecting building materials but are a significant reason why more and more projects – such as the Poly Canyon Village student housing complex-are opting for steel. Situated on 30 acres (12 hectares) at the base of the picturesque Poly Canyon in San Luis Obispo, Calif., this two-phased project for California Polytechnic University is comprised of nine buildings in three “neighborhoods” (each with their own look), four and five stories over slabs and podiums. Once complete, the 2,700 new beds it will add will help the university fulfill its goal of providing on-campus housing for all freshmen and sophomores. 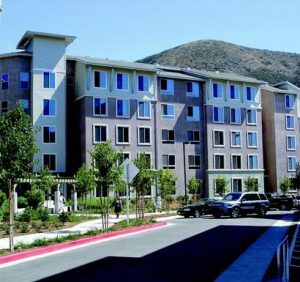 At 820,000 square feet (76,178 m2) with 11,000 load-bearing wall panels, Poly Canyon Village is the largest cold-formed steel load-bearing project in California and the most sizable student housing complex ever undertaken by an American university in a single construction project. While initial consideration was given to wood and concrete masonry, steel won out as the building material for its durability, design flexibility and green advantages.